This large disc, designed by Robert Dudley and constructed by Charles Whitwell, was probably a part of a more complex instrument, described in Dudley's Arcano del mare. It was intended for use in calculating bearings during navigation, for finding the celestial reference points, and thus determining the route to be followed. 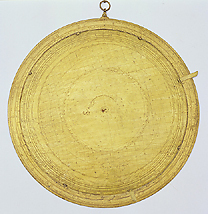 The instrument was provided with accessories allowing it to carry out its various functions, including the graduated ruler and graduated circle which now accompany it. The instrument belonged to the bequest left to the Grand Duke of Tuscany by Robert Dudley in 1649, and appears in early Medicean inventories as a 'nautical astrolabe'.